These lovely photos were taken at October Plenty last Sunday by Cecilia Orning from Sweden. 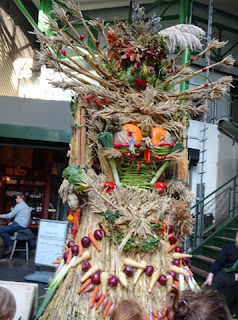 October Plenty is an autumn harvest celebration combining ancient seasonal customs and contemporary festivities that takes place around Shakespeare's Globe, Bankside and Borough Market in Southwark, south east London, every year. It is performed by The Lion's Part, which enacts seasonal plays from England's traditional ritual year. Cecilia sent me the pictures and said: "I live in Sweden, but was in London for a visit up until yesterday. A friend of mine, still in Sweden, found your blog, so I was able to go to Cross Bones Cemetery and also join in the October Plenty festivities in Borough." She added: "I would not have been able to find these things without your blog. Next time I plan a visit to London, I’ll make sure to check out your blog before leaving. Thank you so much and hope you will have a very wonderful Samhain and that the Goddess bless you in all!" Thanks very much Cecilia for the lovely photos and for the kind words about A Bad Witch's Blog. Glad my events listing was useful. I hope you have a superb Samhain. Goddess bless you too! The photograph is copyright Cecilia Orning. 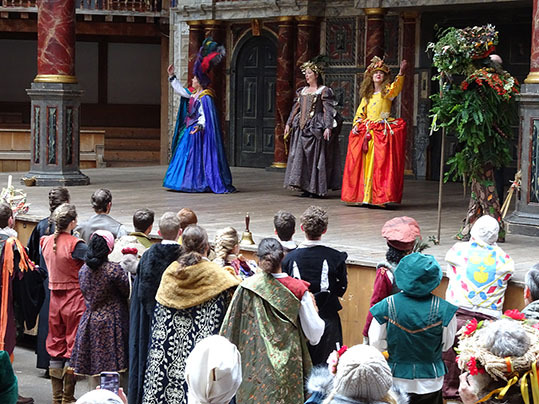 The picture at the top is of the play inside the Globe, the one to the right is of a corn queen.